Intricate details at the bust of this dress amp up an otherwise simple style. The Mesh Together A-Line Dress is fully lined, except at the mesh panels which are semi-sheer. It has a sweetheart neckline, lightly padded bust, and adjustable spagetti straps. The top bust part of this dress is made of a sturdy substantial fabric that is intricately pieced together. Semi-sheer mesh panels below the bust add a flirty touch to this look. A banded empire waist gives way to the flowy chiffon skirt. Fabric ruching at the back and a hidden side zipper complete this look. The Mesh Together A-Line Dress is a simple, yet stylish dress that can be accessorized so many different ways. It would look perfect paired with pumps, strappy heels, or wedges and a brightly colored purse. Details: Fully lined except at semi-sheer mesh panels. Lightly padded bust. Adjustable spaghetti straps. Hidden side zipper. 50% polyester, 35% rayon, 10% nylon, 5% spandex. Hand wash cold with like colors. Do not bleach. Low iron. Small measurements: Length from top of bust to hemline: 28". Bust: 30". You have added Mesh Together A-Line Dress in Dark Navy into Wishlist. You have added Mesh Together A-Line Dress in Dark Navy for Stock Notification. 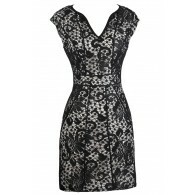 You have set Mesh Together A-Line Dress in Dark Navy as a loved product. You have removed Mesh Together A-Line Dress in Dark Navy as a loved product.